"Tsaritsyn" redirects here. 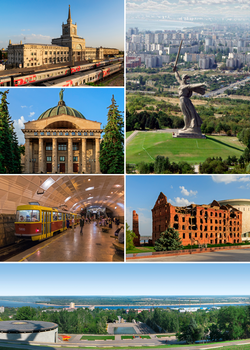 For similar names, see Tsaritsyno (disambiguation). "Stalingrad" redirects here. For the World War II battle, see Battle of Stalingrad. For other uses, see Stalingrad (disambiguation). 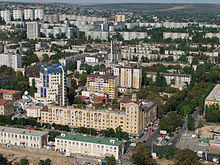 Volgograd (UK: /ˈvɒlɡəɡræd, ˈvɒlɡoʊ-/, US: /ˈvɒlɡə-, ˈvoʊlɡə-/; Russian: Волгогра́д, IPA: [vəɫɡɐˈɡrat] ( listen)), formerly Tsaritsyn (Russian: Цари́цын​ (help·info)), 1589–1925, and Stalingrad (/ˈstɑːlɪnɡræd, ˈstæl-, -ɡrɑːd/; Russian: Сталингра́д​ (help·info)), 1925–1961, is an industrial city and the administrative centre of Volgograd Oblast, Russia. 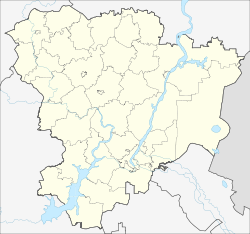 The city lies on the western bank of the Volga River. Although the city may have originated in 1555, documented evidence of Tsaritsyn at the confluence of the Tsaritsa [ru] and Volga rivers dates only from 1589. Grigori Zasekin established the fortress Sary Su (the local Tatar-language name means "yellow water" or "yellow river") as part of the defences of the unstable southern border of the Tsardom of Russia. The structure stood slightly above the mouth of the Tsaritsa River on the right bank. It soon became the nucleus of a trading settlement. In 1670 troops of Stepan Razin captured the fortress; they left after a month. In 1708 the insurgent Cossack Kondraty Bulavin (died July 1708) held the fortress. In 1717 in the Kuban pogrom [ru], raiders from the Kuban under the command of the Crimean Tatar Bakhti Gerai [ru] blockaded the town and enslaved thousands in the area. In August 1774 Yemelyan Pugachev unsuccessfully attempted to storm the city.